one-on-ones | If you want life to change, YOU have to change! I hate April Fool’s Day. Most of the pranks are so lame and unoriginal, that it’s exhausting dealing with the day. So needless to say, I don’t participate (willingly) in the “zaniness” of the day. But I ended up doing something foolish this afternoon. I had a one on one scheduled this afternoon with a friend of mine (from high school) who is a teacher. She’s also a soccer mom. So we met at a park where her daughter was practicing. So I had my list of things that I had to make sure that I took care of prior to leaving for my appointment. It was like a checklist of sorts. I found myself running through it in my mind as I drove to Ayala Park in Chino. I charged the battery in my portable case, so that I could demo the video phone. I made sure that I had a magazine and DVD to give her afterward. I remembered to take a 1-10 sheet with me…DOH TWENTY MINUTES AFTER I LEFT THE HOUSE!!! So I ended up telling the story from memory. I was authentic and she was skeptical. But I continued to be real and upfront, and she came around. We agreed to get together again next week to go over things in greater detail. It’s been eleven years since I had seen her, and it had been eighteen years before that. Credibility and trust take time. Today I got a late start. I had trouble sleeping last night and then had to get up at 5:30 a.m. to take my daughter to swim practice. Since I didn’t fall asleep until about one this morning, I was operating on about four hours of sleep. So I went back to bed after dropping my daughter off and decided to let my body dictate when it was ready to get up. I am not the kind of person who lives to sleep (unlike my teenage daughters). My body told me it was done sleeping at 9:20. So I got in a solid eight hours. That is one of the benefits of working for yourself. You don’t have a boss dictating when you have to get up. I went thru my morning ritual of reading and journaling, got caught up on some Spring Training baseball news and then I was off for a lunch meeting with a friend of mine from my high school days. This friend of mine was voted “Most Likely to Succeed” when we graduated from high school. She has always been a hard worker. She has also become a great networker. She is the PR Director for a major health care provider. The last time that I had met up with this friend, we had coffee and I used that time to pique interest with her. 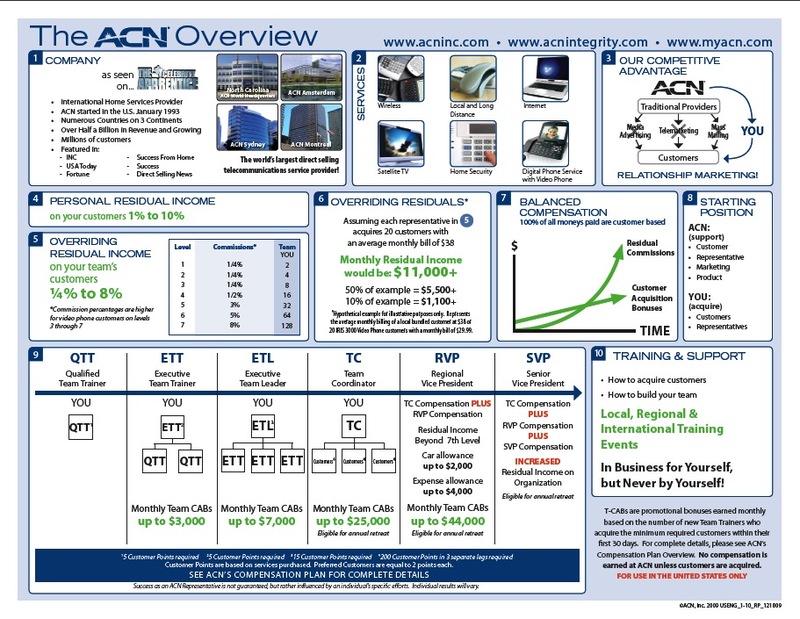 I showed her the videophone and she told me that she had already been exposed to ACN because a friend of hers had tried to “get her in” for years. I asked her at that point if she was open to talking about ACN some more, and she said yes. So we met today to talk about again. There are times when you have to play things by ear. Today was not the time to go thru a standard 1-10 presentation with her. It would have been boring. It would have been insulting. She’s already seen it before. So instead I brought the 1-10 sheet and had it available just as a reference piece to refresh her memory. What I really wanted to know was what her life looks like right now and what she would like it to look like. While she maintained that she loves her job, she also acknowledged that she wouldn’t mind running her own show and calling her own shots. She said that her job is extremely stressful and non-stop. She also has some other issues in life right now that make starting a new venture just a bit complicated. But she also admitted that she isn’t above leaving her current position for another company. She also said that when her youngest daughter graduates from high school in a few years, she would probably go back to school for another degree (she’s a very intelligent woman). We talked about ACN being a vehicle to set up the rest of her life. I even had one of my partners (who went to high school with us) drop by to say “hi” and talk to her about why he is now with ACN. In the end? She said that the timing probably wasn’t right for her and ACN at this point. I invited her to come to our Business Overview Meeting this Thursday. I sent her the details and we’ll see if she shows. If not, hopefully she’ll help me out as a customer. After she left, my business partner and I talked about launching a weekly Saturday Training in the area. The Redlands office closed recently and we both agreed that there is a vacuum in the San Gabriel Valley and Inland Empire as far as training is concerned. So we’re going to approach our upline Rich Secchiaroli about supporting us with a Super Saturday to kick things off in about a month. When I got home this afternoon, I emailed the directions to Thursday night’s BOM to my friend from lunch, and returned a few other emails. I then got on the phones and made an appointment to do a 1 on 1 with another old friend from high school. She’s a single mom and is a teacher. When I asked her if she is open to making some extra money outside of teaching, she said she is looking into becoming a Notary to make extra money. She can’t make it to our Thursday night BOM, so I am going to her kid’s soccer practice Thursday afternoon to talk to her. Sometimes you can’t lead the horse to water. 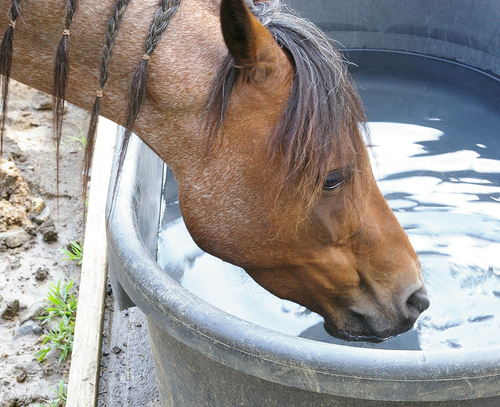 Sometimes you have to take the water to the horse (sorry Patty…you’re much prettier than any horse I’ve ever seen). And that’s the point. Personal presentations can take place any time, any place, any way. If you want to have what other people don’t have, you have to be willing to do what other people won’t do. Yesterday I was in South Pasadena doing a one-on-one presentation for a friend of mine who I’ve known since elementary school. Miguel is a fireman who has been with his Department for twenty years. He’ll be eligible for retirement in four years. In order to retire with health insurance, he’ll need to work for another six years beyond that. When I ran into him at a reunion picnic a few weeks ago, he told me that there was no way that he was going to “make it” another 10 years. So I called him and asked him if he was open to taking a look at a way to make money outside of fighting fires. He accepted my invitation and we met for lunch yesterday. One thing that really bothers me about some people in this industry is the “disposable” way that prospects can be treated. Prospects are really just people. If you’re working the business the right way, these people are (or were at one time) your friends. So I felt a need to catch up with Miguel and find out what is going on in his life. We talked about faith and marriage. Our conversation took a turn that I would never have anticipated. Miguel has a bit of an abrasive personality. I would imagine that it has served him well in fire houses for the past two decades. But underneath the veneer, was a sensitive and giving man. I was pleasantly surprised. Men typically keep conversations light and superficial. My lunch with Miguel was anything but. After spending about 90 minutes “catching up,” we then went to Starbucks to grab a cup of coffee and go over ACN and how he might fit in. When all was said and done, Miguel gave me plenty of reasons ACN probably wasn’t for him (he considers himself “lazy,” he’s not money-motivated etc…), but then he said that he wanted to at least check out the training Saturday. I was shocked, but happy. Then I was off to Chino Hills to meet a co-worker of my wife who she has been talking about since we got involved in ACN a few months ago. This woman and I share a common professional background (Training) and we built rapport quickly. By the time we were done with the presentation, “Priscilla” was so excited and could not wait to get home to talk to her husband. She just “knew” that he was going to LOVE ACN. I’ve been around long enough to know not to send her home empty-handed so she went on her way equipped with a DVD and “Success from Home” magazine. We had two new people coming to Saturday training. The “emotional rollercoaster” was definitely on the upswing. “Crap” I thought, Priscillas husband must have turned out to be a rotten apple. I texted her back to find out what was wrong. I received the following message back, “Her hubby joined 2 weeks ago with his dad.” “CRAP” I thought (again) to myself (this time with more feeling). We all hear about the sense of urgency in talking to people we know. If we don’t talk to them, someone else will. It finally happened to us. The thing that REALLY upset my wife was that she had piqued interest with Priscilla a month ago, but hadn’t followed up until a few days ago. I was amazed at how her husband could have joined ACN 2 weeks ago and not have said anything to her in all that time. Different strokes I suppose. I texted my wife back and reassured her that it was a “lesson learned” and would only serve to give us a good “story” for training. After a few texts, she resigned herself to the news. At least we had one new person going to Saturday training still. An hour later? I got a phone call back from another friend of mine named Carlos, who I had “piqued” earlier in the week. I invited him to come to our Saturday training and he accepted. We had TWO new people coming to training again…YES!!! An hour and a half after that? Miguel called to tell me that he had decided to “pass” on ACN. I respected the call (and actually appreciated him calling instead of just standing me up). The emotional rollercoaster was definitely on a downward slope now. But at least we still had Carlos coming. Just 10 minutes ago (as I was typing this blog post), I received a text from Carlos telling me that something had “come up” with the death of an uncle in another country and he wouldn’t be able to make it tomorrow. UGH, three strikes and you’re out. This business is about “sorting” not “selling. Miguel sorted himself out. Carlos has sorted himself out (for now) and Priscilla sorted herself in (but thru her husband). The “highs” of yesterday have been replaced by the “lows” of today. The lesson in all of this? We just need to talk to MORE people next week. It’s just that simple. The answer is ALWAYS to talk to more people. My daughter is leaving for college tomorrow. I’m taking the rest of tonight off. Seventy-six more days left until Anaheim. Yesterday was a day for phone calls. Time to set up appointments for the rest of the week. The first one-on-one of the week was last night with a Finance Major from Cal Poly Pomona. When all was said and done? She was more interested in getting a “job” with ACN in the Finance Department. Today took me to San Diego to meet with a referral that a friend of mine sent my way (a cousin of my friend). Unemployed and waiting for her Navy boyfriend to return from his deployment, she was anxious to hear more about the company. She became dismayed that ACN was a network marketing company. She and her boyfriend had previously dabbled with a company that sells “legal insurance.” That was enough to sour her on the whole industry. I just laughed to myself internally. It’s amazing how closed-minded some allegedly “open-minded” people can be. They say that a mind is just like a parachute: it only works if it’s open. I chided that to the woman I was presenting to that if she was “close-minded” there is nothing I can do about that. She responded that she wasn’t close-minded at all. And then she proceeded to tell me why she wouldn’t even consider ANY network marketing company. I didn’t get mad. It’s just a part of the journey. Building an MLM business is all about sorting thru people. In the past two days, I sorted. In the days of the Gold Rush, prospectors were paid to dig thru a lot of dirt. But they didn’t focus on the dirt, they focused on the gold. So I got my hands a little “dirty” today, put a few miles on the car (and racked up $171.87 in mileage deductions in the process). I’m tired but not discouraged. I’m on a journey. I have two one-on-ones scheduled for tomorrow and a BOM. Today is over. 78 more days til Anaheim.